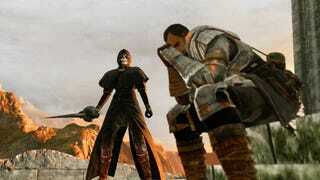 Dark Souls II begins by telling you that you're flat-out screwed. The game opens with a smiling, blind, gap-toothed crone, telling you that you're cursed. If you stay where you are, your memories will fade and you will become a hollow — an empty undead beast that feeds off the souls of the living. Like many cursed before you must journey to a far off land, where an incredibly tiny chance at salvation lies. "Your wings will burn, time after time," she says, mockingly "for that is your fate." The old crone is not just talking to your character — she's talking to you, the player. She's addressing the strange masochist (like me) who allows themselves to get repeatedly kicked in the crotch by these games, yet continues to play them. She's saying, "You came back, and you'll come back again. It's inevitable, because that is who you are." If you've never played Dark Souls or its spiritual predecessor Demon's Souls, let me fill you in: They're brutal action role-playing games that do not explain a damn thing to you. Imagine Zelda fused with 2nd edition Dungeons and Dragons, with a mean streak six mile wide. You're not going to have your hand held. You will get stuck. You will get angry, frustrated, amused and want take a sledgehammer to your controller. But once you understand the psychotic dream logic of these games and recognize that at their core they are ultimately fair, you will feel a genuine sense of accomplishment. In gaming, that sensation is all too fleeting. Dark Souls II continues the psychotic tradition of its forebears, this time in the kingdom of Drangleic. Like the games before, much of the plot is not told to you outright, but rather alluded to by a series of cryptic NPCs. The characters that help you in on journey are cursed as well — slowly losing their memories and humanity. It's a world of the dead and dying, at the bleak twilight of a once great nation. While much of the the tone and feel of the game has stayed true to Dark Souls, many of the core mechanics have been tweaked for the better. Many of these tweaks — like the focus on a hub area with a spooky maiden and the ability to warp between bonfires from the beginning of the game, are direct callbacks to the structure of the original Demon's Souls. One particularly interesting change is that individual enemies stop spawning after you kill them dozens of times. This keeps the pace of the game going by both throttling particularly difficult trouble spots and preventing players from lingering on a specific area. Players can then undo this using a very specific item at bonfires, allowing them to replay particularly tough boss fights and zones at a ramped up difficulty. 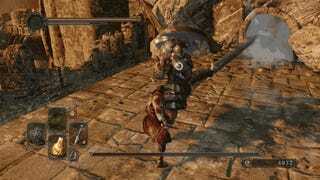 One possible criticism you could levy against Dark Souls II is that at times it is a overly obtuse and illogical. Frequently I found myself frustrated and unsure where exactly I was supposed to go. Vital parts of the game are hidden in esoteric locations. Switches can be easily missed and paths to vital parts of the game remain hidden. One particularly infuriating example: If you do not talk to a specific NPC a certain number of times, they will not unlock a path leading to a giant chunk of the game. This kind of stuff might push away first-time players. On the other hand, that very lack of context forced me to talk with other people that were playing Dark Souls II in tandem with me. It was a modern version of the playground conversations I had as a child, those days of swapping tricks and helping each other muscle through a particularly rough game. Much of that sense of communication might be lost once the game is out and walkthroughs become ubiquitous. 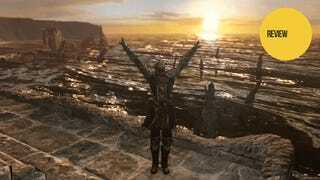 After it was announced, many people including me wondered and hoped that Dark Souls II would still be Dark Souls. On a some level, it is. The 'soul' of Dark Souls, that cruel yet fair sense of respect, is still there in all its unadulterated glory. But on another level, Dark Souls II is something much more — a game that carefully considers its lineage at every turn, makes significant and complex departures from the formula when it needs to and expands its scope. Reviewing this game took weeks off my life, leaving me sleep-deprived, stressed and sick. Meals were skipped and at most I slept 3 hours a night. But I beat it. I won. And that sense of accomplishment, that ability to look back and see a game as an actual journey, is the heart of what Dark Souls II is. I'll be damned if it was any other way. Now if you'll excuse me, I need a nap. Full disclosure: this review was done on review code, before any servers were live. Multiplayer and PvP were not available. I will update this review when the servers are live and I have put a significant amount of time into retail version of the game.